Leaving Certificate or Leaving Certificate Applied or LCVP or QQI Level 4 Award. Equal consideration will be given to mature applicants (those aged over 23) who do not meet these entry requirements. 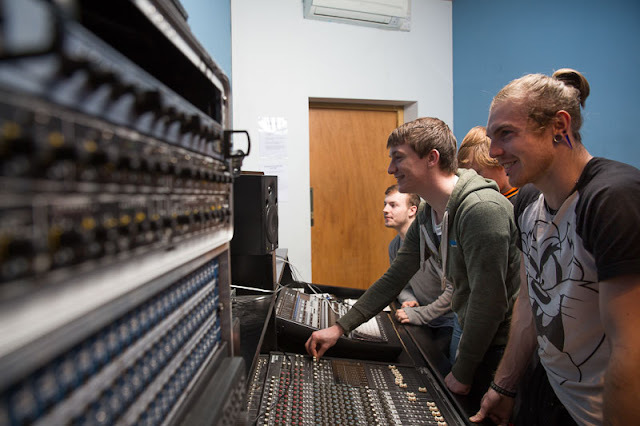 This course focuses on the practical use of audio and music technology in a number of settings, including the recording studio, post-production, live sound, sound design and audio for video. Students participate fully in recording studio sessions. They will create, produce and mix music, engineer live performances, programme sound synthesisers, sequence drum and instrument tracks, and also create sound effects and Foley sounds for video. These activities are supported by theory sessions in sound creation, music theory, acoustics, media studies, signal processing and much more. ProTools is used in the studios and editing suite, offering an ideal environment where students can apply their knowledge and skills. Graduates of this course will be able to pursue many differing opportunities across the music industry as producers, sound engineers, Foley artists, arrangers and composers. Elsewhere: Graduates are also eligible to apply through the CAO and/or the Higher Education Links Scheme for entry to year one of a range of higher certificate and degree programmes at Institutes of Technology and Universities (please check with the particular institution regarding local eligibility requirements).